Over the past few weeks I've been getting a ton of emails from Loud Records promoting the resurrected record label's ongoing contest to find the best unsigned rappers on the internet. After checking out the current round of the competition, which has a grand prize of $100,000, I can't say I'm impressed by their selections. Loud, once the home of acts like the Wu-Tang Clan and Mobb Deep, seems to have jumped on the bandwagon of ringtone rap, as most of their semifinalists sound like they came from the Hurricane Chris school of MCing. If that were my only exposure to the world of unsigned hip hop, I'd be very concerned about the future of the music. As has been proven by the many artists who have contributed material to this site, however, there's a lot of great hip hop that's being overlooked by the major labels. Not to come off like I'm feeling myself, but I would put just about any unsigned artist who's had their music featured on this site up against the winners of Loud's contest. 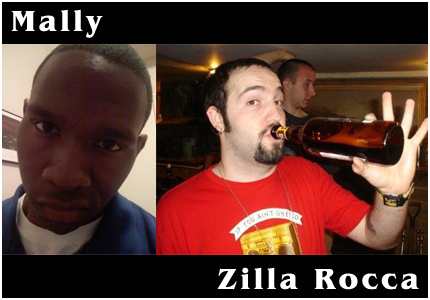 The track is off Zilla's upcoming mixtape, Bring Me The Head of Zilla Rocca!, due out in 2008 (the track posted above is an unmastered version). The mixtape itself is a precursor to an eventual solo album, Fall Back Friday. He's a busy man, but you can catch him over at Passion of the Weiss doing the occasional guest post or you can always just hit him up on MySpace. As for Mally, he's currently working with producer Redwine on the followup to his debut The Letter. If you haven't copped that album yet, stop what you're doing and go download it. It's required listening for any fan of hip hop.